Baroness Hilla von Rebay (Germany, 1889-1978, USA). Born in Strasbourg in 1890, Hilla Rebay (Baroness Hilla Rebay von Ehrenwiesen), studied art in Cologne, Paris, Munich, and Berlin, and was interested in Theosophy and diverse religious and spiritual ideas. Although Rebay had obtained a solid academic training as a portrait and figurative painter, she would later devote herself to non-objective painting: art without representational links to the material world. 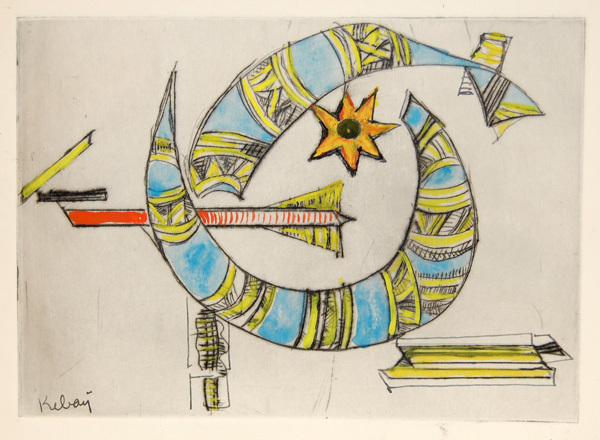 She associated and exhibited with the Dada group in Zurich and Galerie Der Sturm in Berlin, participating actively in the European avant-garde. In 1927, Rebay moved to the United States and met Solomon R. Guggenheim (18611949), becoming his artistic adviser. She influenced him to purchase non-objective art, which she believed to be infused with spirituality. Rebay served as the first director and curator of Guggenheim's Museum of Non-Objective Paintingwhich would be renamed the Solomon R. Guggenheim Museum in 1952and instituted a series of traveling exhibitions devoted to Guggenheim's collection. In 1943 her vision of a "museum-temple" led her to choose Frank Lloyd Wright to design a permanent museum for the collection. Notwithstanding her museum activities, Rebay had a long artistic career, during which she exhibited in museums and galleries in Europe and the United States. She produced a prolific array of non-objective and figurative paintings and works on paper, including collages, a medium in which she particularly excelled. In 1952, due to philosophical differences with Solomon Guggenheim's nephew, Harry F. Guggenheim, the president of the Solomon R. Guggenheim Foundation, Rebay resigned as director of the museum but continued her relationship with the institution in the role of director emeritus. 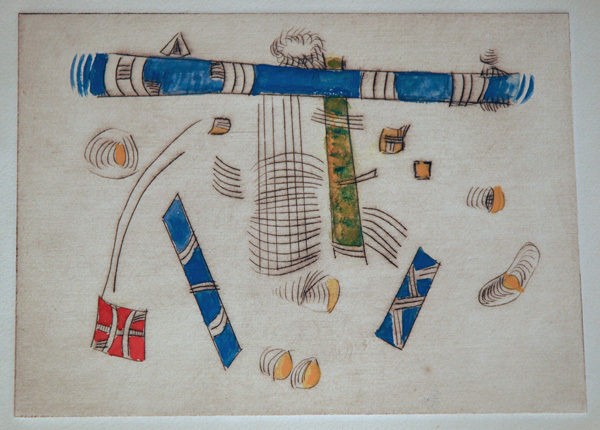 Part of her estate, which included works by Vasily Kandinsky, Paul Klee, and Kurt Schwitters, was given to the Solomon R. Guggenheim Museum four years after her death in 1967. Rebay's crucial role in founding the Guggenheim Collection and her insistence on Non-Objective Art (she disliked the term Abstract Art) as the key to the essence of art is of crucial importance to the history of modern art in the US. The Museum of Modern Art focused on the Paris School (Picasso, Matisse, Braque, Chagall, Miró) in their explorations of modernity; thanks in large part to Hilla Rebay, Solomon Guggenheim bought many exceptioinal works by Kandinsky and other "non-objective" artists and so offered another approach to understanding modernity. 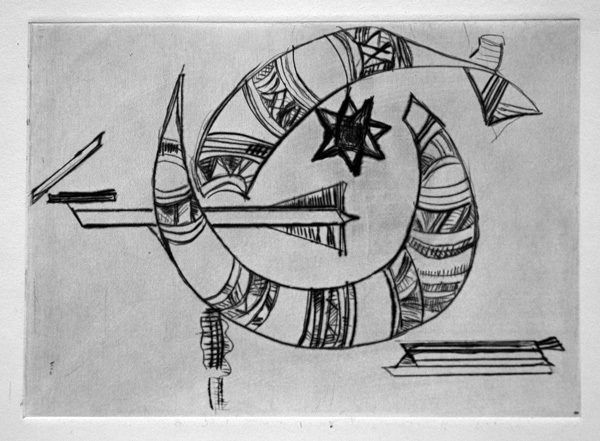 In a wonderful oral narrative in the Smithsonian Archives of American Art, Rebay offers a wonderful story about the beginnings of her movement away from Cubism: "during the war when we had this house filled with wounded, I said in the middle of the night, between those wounded men, I said to myself 'And yet there is an art in painting'. . . I knew there was an art in painting because there are forms - there's light and heavy on a canvas - there's delicate and strong on the canvas - there is a square - there is a triangle - there is a straight line, there is a horizontal line - there are so many absolutely pictorial tools in existence with which I could animate this space and bring it to rhythm and to life and to creation. That is Art and that I was going to search and do. I was in this hospital where we had brought soldiers over the Rhine when I was ordered to go in a train to supervise wounded. This train went to Strasburg and there my mother was, standing across two rail lines on the other side, organizing traffic for wounded and so on. And I called over to her 'And yet there's Art in painting.' I'll never forget that. She couldn't understand what I meant. I couldn't wait until I could get out and when they had enough nurses, I began to create. That's how I came to Non-Objective painting. In 1915 Switzerland invited me to show my last known paintings which were cubistic - they were objective, but cubistic. I was invited to Basle and Zurich and I got permission, which was difficult, to leave Germany to see my exhibitions. I was invited by Busoni, the pianist, who had bought some of these cubistic paintings and when I got to the hotel there was a letter from Busoni asking me to come and he would play for me that night. Wasn't that nice? So I went and he played for me a whole night Bach. The next morning his wife brought us coffee and then he said I must meet the painters there . . . Hans Arp and others. That was the first time I had ever met modern painters. Hans Arp was Non-Objective. He made collage, you know, and he was always more or less a dreamer. He was never a creator but he was very much up my line. After seeing my cubistic things in the exhibition he asked me if I had gone on with that. Then he said we must write to the der Sturm [Art Gallery in Berlin]. Have you heard of the der Sturm. And the der Sturm invited me to Berlin for an exhibition of my Non-Objective paintings." Select Bibliography: The only important work on Rebay is the book prepared to accompany a major retrospective of Rebay's art and her role in building the collection of what wold become the Guggenheim Museum edited by Jo-Anne Birnie Danzker, et al, Art Of Tomorrow: Hilla Von Rebay and Solomon R Guggenheim, NY:, Guggenheim Museum, 2005. See also the 1966 oral history with Bruce Hooten at http://www.aaa.si.edu/collections/oralhistories/transcripts/rebay66.htm. Rebay also translated Kandinsky's crucial theoretical text from German into English, On the Spiritual in Art ed & trans Hilla Rebay (NY: Solomon R Guggenheim Foundation, 1946). Composition I. Original monoprint with hand-coloring over an etching; pencil signed lower right. Rebay liked to make original works of art and send them to friends as holiday greetings. She worked on sheets of wove paper folded in half to leave space for messages within. All of our pieces came from an estate sale and were accompanied by samples of Rebay's letterhead, envelope, card inserts, and several photographs of her on her Westchester County estate and of her with friends, including a hand-colored one of her, Solomon Guggenheim, and Frank Lloyd Wright. Image size: 125x173mm. Price: $1500. Composition II. Original monoprint with hand-coloring over an etching; pencil signed lower right. Rebay liked to make original works of art and send them to friends as holiday greetings. She worked on sheets of wove paper folded in half to leave space for messages within. All of our pieces came from an estate sale and were accompanied by samples of Rebay's letterhead, envelope, card inserts, and several photographs of her on her Connecticut County estate and of her with friends, including a hand-colored one of her, Solomon Guggenheim, and Frank Lloyd Wright. Image size: 125x173mm. Price: $1500. Composition III. 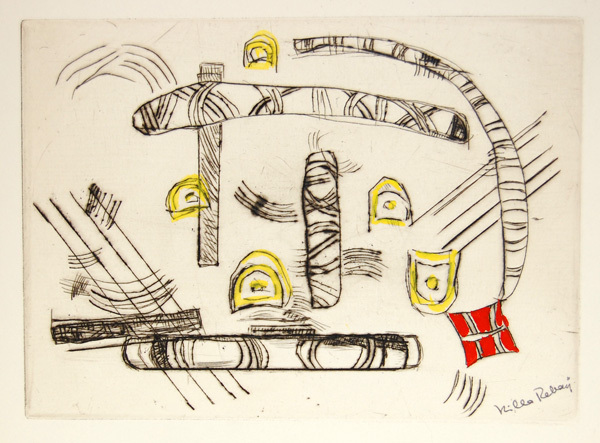 Original monoprint with hand-coloring over an etching; pencil signed in red crayon on the inside of the card (see below). Edition unknown. Rebay liked to make original works of art and send them to friends as holiday greetings. She worked on sheets of wove paper folded in half to leave space for messages within. All of our pieces came from an estate sale and were accompanied by samples of Rebay's letterhead, envelope, card inserts, and several photographs of her on her Connecticut County estate and of her with friends, including a hand-colored one of her, Solomon Guggenheim, and Frank Lloyd Wright. Image size: 125x173mm. Price: $1500. Composition III. Original monoprint with hand-coloring over an etching; pencil signed in red crayon on the inside of the card (see above). Edition unknown. Rebay liked to make original works of art and send them to friends as holiday greetings. She worked on sheets of wove paper folded in half to leave space for messages within. All of our pieces came from an estate sale and were accompanied by samples of Rebay's letterhead, envelope, card inserts, and several photographs of her on her Connecticut County estate and of her with friends, including a hand-colored one of her, Solomon Guggenheim, and Frank Lloyd Wright. Image size: 125x173mm. Price: $1500. Composition IV. Original etching. Edition unknown. Rebay liked to make original works of art and send them to friends as holiday greetings. She worked on sheets of wove paper folded in half to leave space for messages within. This work comes with a printed insert. All of our pieces came from an estate sale and were accompanied by samples of Rebay's letterhead, envelope, card inserts, and several photographs of her on her Connecticut estate and of her with friends, including a hand-colored one of her, Solomon Guggenheim, and Frank Lloyd Wright. Image size: 125x173mm. Price: $500. Composition IV. Original monoprint with hand-coloring over an etching; signed in ink lower left. Rebay liked to make original works of art and send them to friends as holiday greetings. She worked on sheets of wove paper folded in half to leave space for messages within. This work comes with a printed insert. All of our pieces came from an estate sale and were accompanied by samples of Rebay's letterhead, envelope, card inserts, and several photographs of her on her Connecticut estate and of her with friends, including a hand-colored one of her, Solomon Guggenheim, and Frank Lloyd Wright. Image size: 125x173mm. Price: $1500. 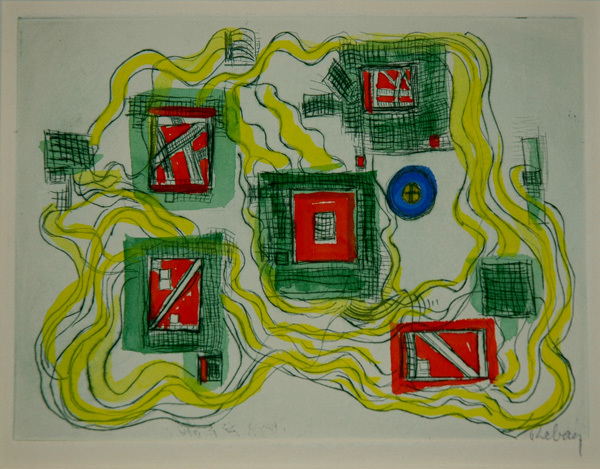 Composition V. Original monoprint with hand-coloring over an etching; signed in ink lower right. Edition unknown. Rebay liked to make original works of art and send them to friends as holiday greetings. She worked on sheets of wove paper folded in half to leave space for messages within. All of our pieces came from an estate sale and were accompanied by samples of Rebay's letterhead, envelope, card inserts, and several photographs of her on her Connecticut County estate and of her with friends, including a hand-colored one of her, Solomon Guggenheim, and Frank Lloyd Wright. Image size: 125x173mm. Price: $1500. Untitled. Original pen and ink drawing. Rebay liked to make original works of art and send them to friends as holiday greetings. She worked on sheets of wove paper folded in half to leave space for messages within. This work comes with a printed insert. All of our pieces came from an estate sale and were accompanied by samples of Rebay's letterhead, envelope, card inserts, and several original photographs of her on her Connecticut estate and of her with friends, including a hand-colored one of her, Solomon Guggenheim, and Frank Lloyd Wright. In the drawing, all of the lines are very sharp and the black hemisphere is pure black. Looking at this work, I am not entirely sure whether it was meant as a vertical composition or a horizontal one, so I offer this alternative view. 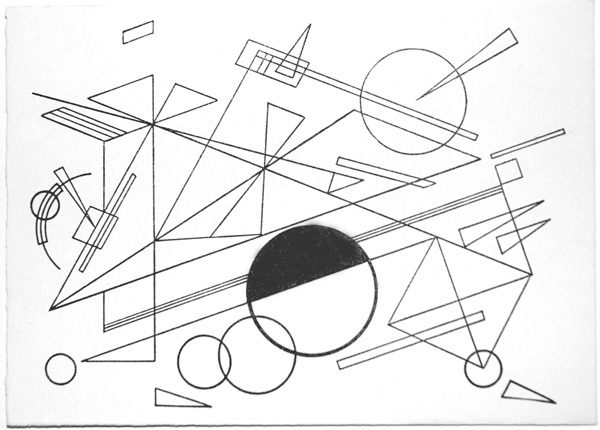 One last nagging thought: this is a very Kandinsky-ish drawing. I wonder if it might actually be a gift to Rebay from Kandinsky (many of the Kandinsky watercolors in the collection of the Guggenheim Museum are gifts from the Hilla von Rebay Foundation to the Guggenheim, making it clear that Rebay owned a substantial number of works by Kandinsky). But perhaps that way madness lies. I regret that we had to use a flash to photograph this and will reshoot it when it is out of its frame. Image size: 177x127mm. Price: NFS. Untitled. Original pen and ink drawing. 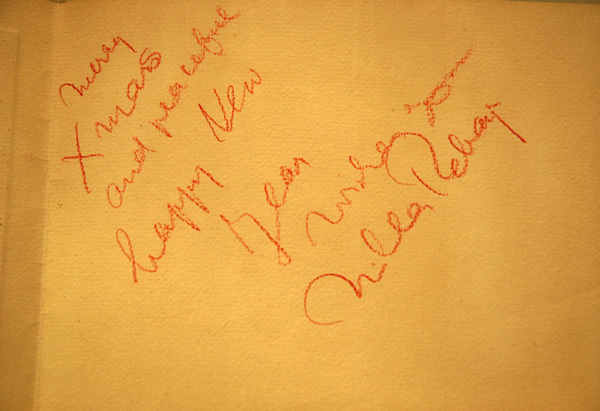 Rebay liked to make original works of art and send them to friends as holiday greetings. She worked on sheets of wove paper folded in half to leave space for messages within. This work comes with a printed insert. All of our pieces came from an estate sale and were accompanied by samples of Rebay's letterhead, envelope, card inserts, and several original photographs of her on her Connecticut estate and of her with friends, including a hand-colored one of her, Solomon Guggenheim, and Frank Lloyd Wright. In the drawing, all of the lines are very sharp and the black hemisphere is pure black. Looking at his work, I am not entirely sure whether it was meant as a vertical composition or a horizontal one, so I offer this alternative view. In the drawing, all of the lines are very sharp and the black hemisphere is pure black. 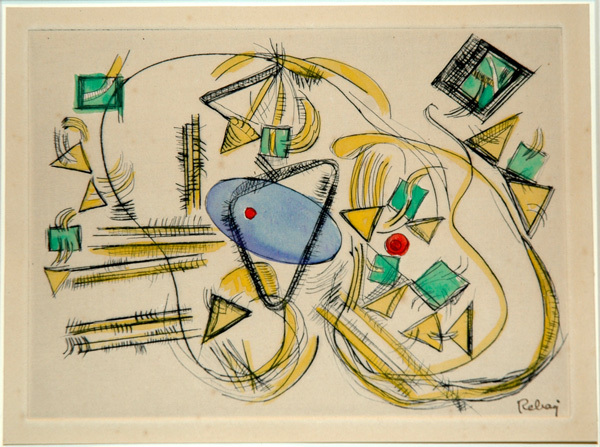 One last nagging thought: this is a very Kandinsky-ish drawing. I wonder if it might actually be a gift to Rebay from Kandinsky (many of the Kandinsky watercolors in the collection of the Guggenheim Museum are gifts from the Hilla von Rebay Foundation to the Guggenheim, making it clear that Rebay owned a substantial number of works by Kandinsky). But perhaps that way madness lies. I regret that we had to use a flash to photograph this and will reshot it when it is out of its frame. Image size: 177x127mm. Price: NFS. For a very interesting comment on the circle in Kandinsky's oeuvre, see Vivian Endicott Barnet, Kandinsky at the Guggenheim (NY: Solomon R. Guggenheim Museum, 1983), p. 43: "the overwhelming frequency with which the form recurs in Kandinsky's oeuvre through the late twenties and into the thirties raises the question of what the circle meant to him. 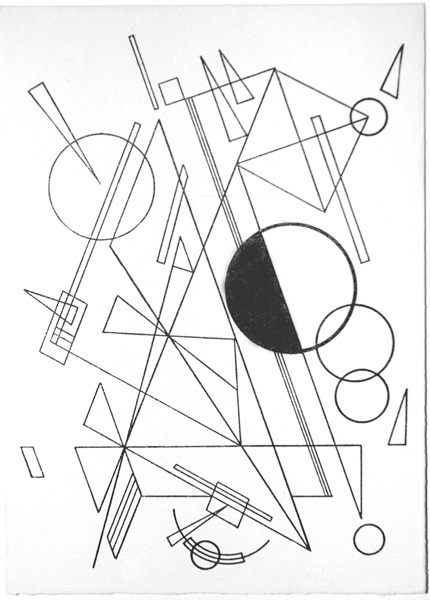 In Point and Line to Plane Kandinsky discussed circles in relation to points and lines and in terms of tension and equilibrium; he also wrote about the birth of a circle. In a letter to Will Grohmann dated November 21, 1925, Kandinsky made it clear that he wanted the viewer to perceive the inner meaning that lies behind the formal concerns evident in his work: 'It is not enough merely to recognize that I use triangles or circles.' In 1929 in response to a psychologist's questionaire, he explained that 'If I have . . . in recent years so frequently and so enthusiastically made use of the circle, the reason (or the cause) is not the geometrical "form" of the circle, but rather my own extreme sensitivity to the inner force of the circle in all its countless variations.' "